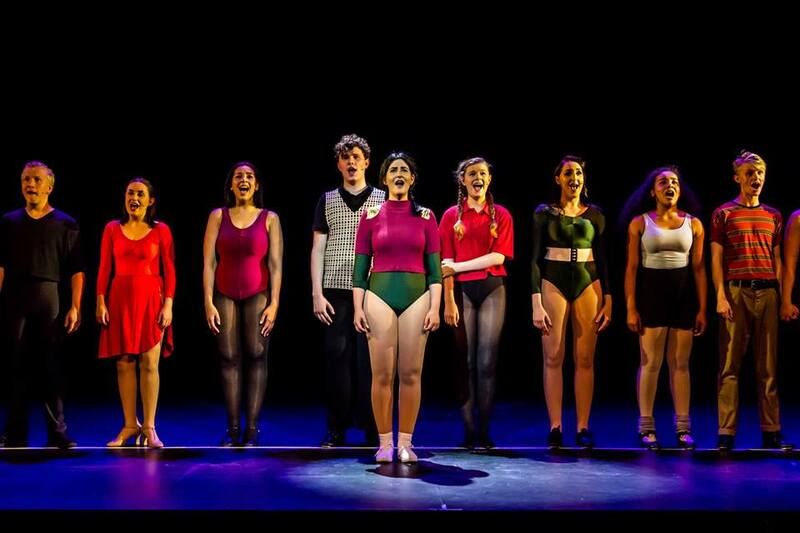 Review: A Chorus Line. Spotlight Theatre Company. Nottingham Playhouse. – East Midlands Theatre. 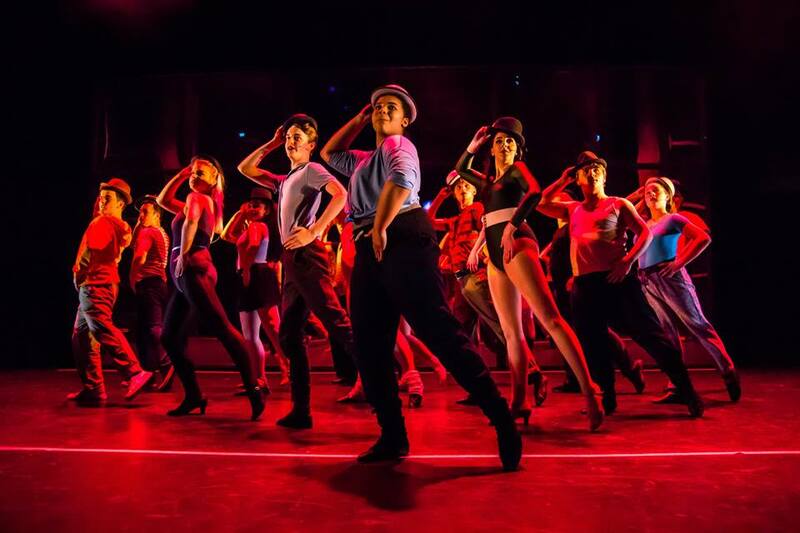 The hit musical A Chorus Line began as an intensely work – shopped play built up from anecdotes and experiences of Broadway dancers transcribed and, initially, containing hours of dialogue, it only had one song. This was way back in 1974-5. The creative process was overseen by choreographer, director and show visionary, Michael Bennett. Joseph Papp of Off-Broadway Public Theater borrowed $1.6 million to produce the eventual musical. The libretto was eventually assembled by former dancer Nicholas Dante and author James Kirkwood. The songs we hear in the musical today were written by award winning composer, the late Marvin Hamlisch (1944- 2012), and lyricist Ed Klebhorn. The concept that emerged was a single set staging of a dance audition in which songs and dialogue overlapped into a multi-layered whole. The rhythmically supple score encompasses various styles from classic Broadway to contemporary soft rock. Whilst the big production number ‘One’ is certainly very catchy there was an original creative concern that the show needed a commercial hit and thus was born ‘What I Did For Love’ which became a pop hit in its day. In any production of A Chorus Line, be it professional or amateur we, the audience, need to believe that the ‘auctioning dancers’ represent the real thing and, given the musical nature of their often sung confessions, we need to feel we are emotionally investing in them as characters. After all they are often giving out their innermost feelings and are vulnerable in their expressions. 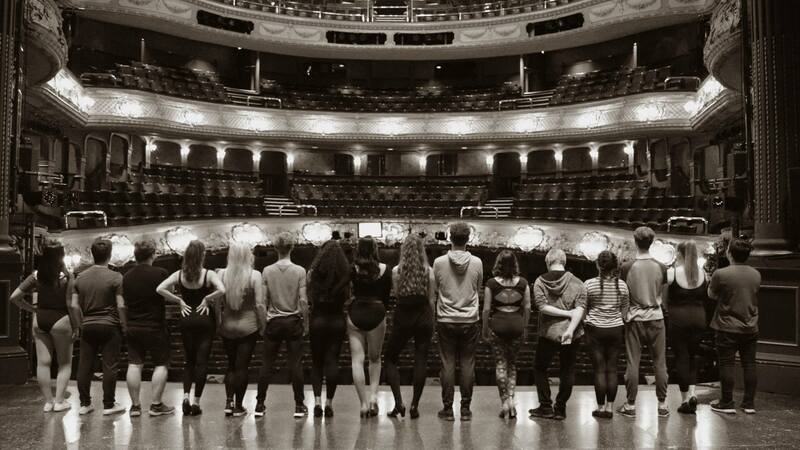 A Chorus Line is more than a bit of theatrical fluff with dance and music. The show’s songs are well known amongst musical theatre goers and include Hope I Get It, At The Ballet, Sing!, Hello Twelve, Hello Thirteen, Hello Love, Nothing, Gimme The Ball, Dance Ten – Looks Three, The Music and The Mirror, One, What I Did For Love. 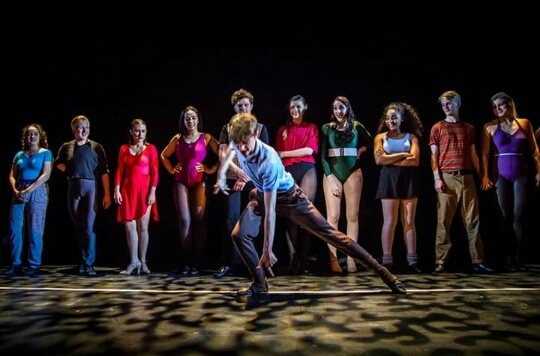 Above all, the final number, One (reprise) should make our hearts leap for joy apropos the dancers who have finally come through the audition process to be cast in the Broadway show and dance professionally for a living. They should look like real troupers and show off their style that makes them stand out as winners. This is quite a preamble but essential knowledge and pre-thinking that this reviewer considers important prior to watching this piece of musical theatre currently playing for two nights at Nottingham Playhouse 7-8 July 2018. A Chorus Line is presented by Spotlight Theatre Company and directed by Amanda Hall. The nineteen strong youthful principal cast are as follows: Liam Hall (Zack), Georgia Hodgett Young (Larissa), Patrick McCrystall (Mark), Grace Hodgett Young (Richie), Sophie Petruccio (Judy), Ellie Monterosso (Diana) Madi Smith (Connie), Matty Collins (Paul), Charleigh Hurst (Val), Joseph Smith (Don), Eva Shepard (Maggie), Stan Cook (Bobby), Maya Thompson (Sheila) Beth Wear (Kristine), Alex Tilley (Alan Deluca), Euan David (Gregory), Poppy Cook (Bebe), Ella Greenwood (Cassie) and James Murray (Mike Costa). The Spotlight Theatre Company production also uses additional performers from the school in certain numbers to great effect. They shine particularly in the ballet sequence and in the song ‘Nothing’ where they show great visual focus. The Spotlight Theatre Company production is musically directed by Mitch Gamble with choreography by Jessica Royce. Lighting comes courtesy of Tom Mowat and the sound designer is Rob Ketteridge. In the story that attends upon a nerve-wracking round of auditions for a forthcoming Broadway show the dancers are encouraged to open up about themselves but some are reticent whilst others are more extravert this is done through a fascinating mix of dialogue, song and dance. Unseen but heard choreographer Zack (Liam Hall) is in full command yet less arrogant than in some productions. The whole show is very professional in every respect and this reviewers concerns that some of the cast might be too young to play the demanding roles was blown out of the water. Each and every performer play their part with confidence and maturity. The songs are given full welly by the entire cast. The movement and dances are performed with energy and control. The direction by Amanda Hall is exemplary and Mitch Gamble’s live band accompanying the show are brilliant. Ella Greenwood’s expressive rendition of ‘The Music and The Mirror’ is one the great song and dance highlights of this complex and dazzling show. Also the company vibe of ‘One’ is terrifically well done followed by a super tap routine and Ellie Monterosso’s ‘What I Did For Love’. In the first act the company as a whole should be commended for their handling of the complex number ‘Hello Twelve’. The musical has some great witty lines and once again Ellie Monterosso as Diana nails the comic – tragic song ‘Nothing’ big time. As Mike Costa, performer James Murray does a terrific job with the song and dance number ‘I Can Do That’. 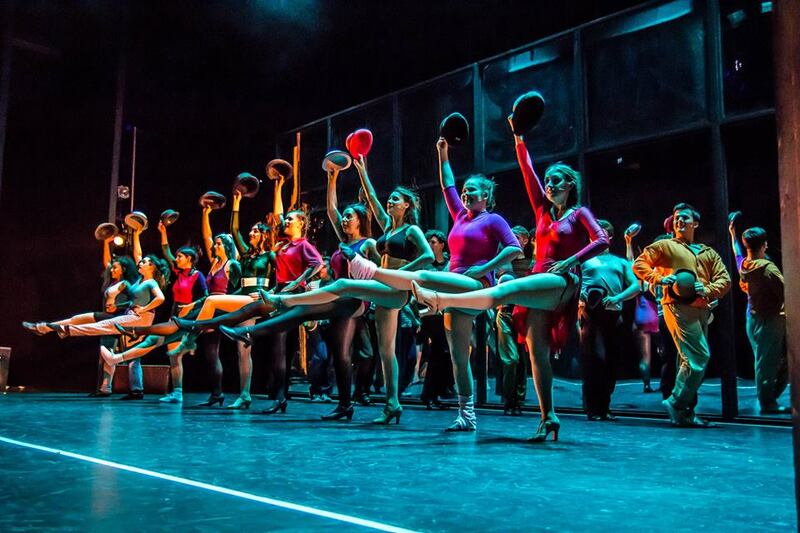 A Chorus Line runs at Nottingham Playhouse until Saturday 8th July. If you are a fan of musical theatre this is certainly one not to miss. My husband and I attended on Saturday night and we’re impressed by these talented youngsters. Stars in the making!